The oldest-known terrier, the Manchester Terrier was bred in England to hunt rats. The best vermin-hunting breed, the Manchester Terrier is extremely fast. Available in both standard and toy varieties, both are considered companion dogs with the same personality traits. Unfortunately, the popularity of the Manchester Terrier has gone down in recent years. 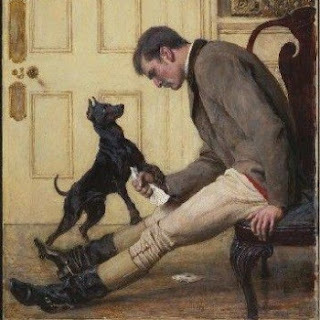 The Manchester Terrier is a small dog, slightly longer than he is tall, with a short coat in jet black with rich mahogany markings. He has a wedge-shaped head with a keen, bright expression shining out of black, almond-shaped eyes. This is a breed with curves. The neck is slightly arched; the topline (back) is slightly arched over the loins; and the abdomen is tucked up with an arched line. The tail tapers to a point and is carried in a slight upward curve. With the exception of size, the only difference between the Standard and Toy Manchester is ear shape. The Standard Manchester has a naturally erect ear, a cropped ear or a button ear. Cropped ears are long and pointed. A Toy Manchester has a naturally erect ear, never one that has been cropped. Other identifiers: Muscular, long tapered head, V-shaped erect ears, dark almond-shaped eyes, black nose, pointed and erect tail. Possible alterations: Standard versions are larger in size. Ears are known to naturally flop over. 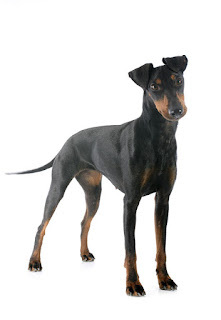 The sleek and handsome Manchester Terrier is thought to have been created by crossing Britain’s black and tan terrier with the Whippet and possibly other breeds such as the Italian Greyhound. He originated in Manchester, where popular sports included rat killing and rabbit coursing. The Manchester was designed to excel at both and became popular throughout Britain. The dogs were eventually imported into the United States. The American Kennel Club recognized the Toy variety in 1886 and the Standard in 1887. 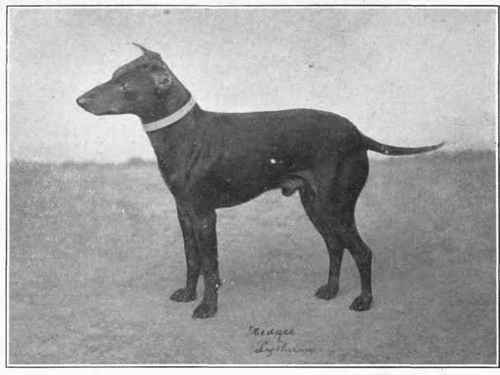 The Manchester Terrier Club of America was formed in 1923. Today the breed ranks 121 st among the dogs registered by the AKC. Manchester Terriers are lively, spirited, sharp-witted dogs. 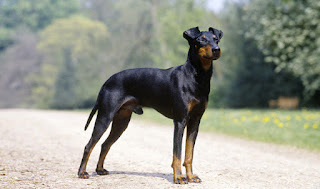 Although they look like small Dobermans, Manchesters are true terriers, through and through. They are extremely smart, somewhat independent and devoted to the people in their close circle. This is neither a cuddly nor a clingy breed. In fact, Manchester Terriers can be stubborn and, like most other terriers, they have a tendency to test boundaries. Manchesters can become destructive and noisy if left unattended for long periods of time. They typically get along well with children, as long as they are well-socialized with kids from an early age. Manchester Terriers are not particularly suspicious of strangers, although they can be a bit aloof and stand-offish. All in all, this is an alert, attentive breed that makes an ideal companion for city-dwellers. Manchester Terriers have an average life span of about 15 years. Breed health concerns may include von Willebrand disease, Legg-Calve-Perthes disease, pattern baldness (mainly in females), Ehler-Danlos syndrome (cutaneous asthenia), lens luxation, cataracts and generalized progressive retinal atrophy (GPRA). These short-haired dogs become easily chilled and should wear a sweater or coat when outside in icy weather for any length of time. Minimal coat care is required for the Manchester Terrier. It is an active and alert breed that should be led on moderate on-leash walks, off-lead outings in safe areas, or fun romp in the garden. Although it likes to spend the day in the yard, it should not be allowed to live outdoors and it needs a soft, warm bed. 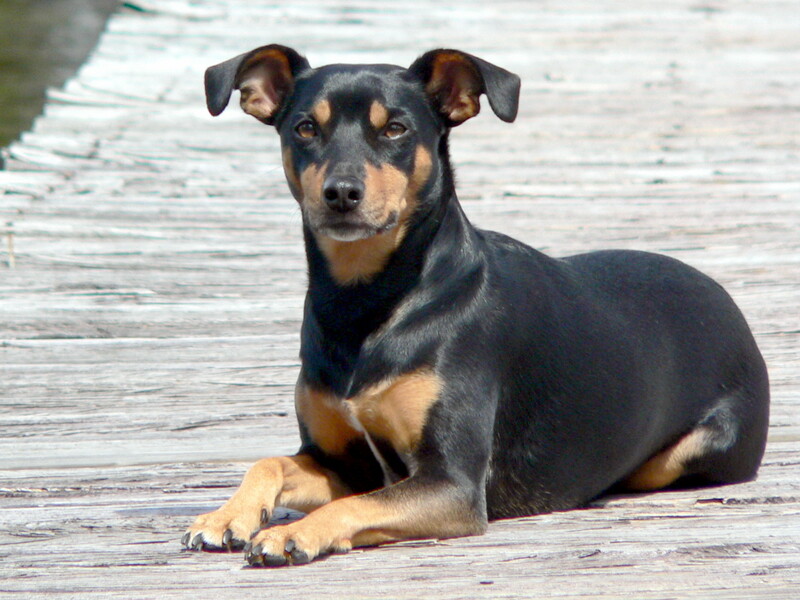 The Manchester Terrier is a good dog for apartment living. They are very active indoors and will do okay without a yard. Manchester Terriers prefer warm climates. Not the easiest breed in the world when it comes to training, the Manchester Terrier needs a patient and calm trainer. His stubborn streak means that the trainer must always have loads of cookies to keep him interested in the session. Harsh methods and yelling will cause this breed to shut down. Many owners have found that their Manchester Terriers can be great therapy dogs. They are easy to put in the car and actually like going for rides, which makes visiting hospitals and nursing homes easy. Providing they were socialized properly and had basic obedience training, Manchesters can do good things for those in less than ideal health. Manchester Terriers are active, athletic dogs, but unlike some little breeds they typically are not neurotic or excessively busy. A healthy dose of moderate exercise should suffice to keep them happy, healthy and fit. Manchesters love to accompany their human family members on all sorts of outings, from a simple stroll around the neighborhood to a trip to the grocery store. They absolutely adore playing fetch. When it comes to grooming, the Manchester Terrier is an easy keeper. Though the breed is naturally clean with little doggie odor, a bath every three months (or when he gets dirty) in a mild shampoo is a good idea. Brush his sleek coat with a natural bristle brush or mitt. Use coat conditioner/polish to brighten the sheen. The rest is basic care. Trim the nails as needed, usually once every few weeks. Brush the teeth frequently with a vet-approved pet toothpaste for good overall health and fresh breath. Check the ears weekly for dirt, redness or a bad odor that can indicate an infection. If the ears look dirty, wipe them out with a cotton ball dampened with a gentle, pH-balanced ear cleaner recommended by your veterinarian. Introduce the ManchesterTerrier to grooming when he is very young so he learns to accept it, particularly nail trimming, patiently. 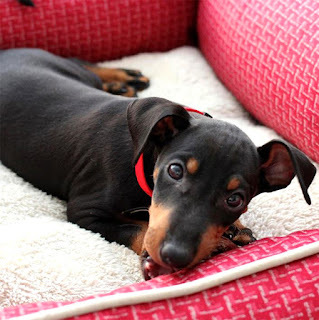 A completely devoted breed, the Manchester Terrier is very loyal, loving and faithful. Active and full of life, it needs a lot of mental and physical stimulation to avoid behavioral problems. Not capable of being left alone for long periods of time, it is in constant need of human companionship. With a natural instinct to hunt, it does not do well with cats but can get along with other dogs if raised with them. Enjoying walks, games of fetch and other forms of activity, it does best with a large yard. A good family pet, it does best with children if introduced to them as a puppy. The Manchester Terrier and Toy Manchester were registered as separate breeds until 1959. 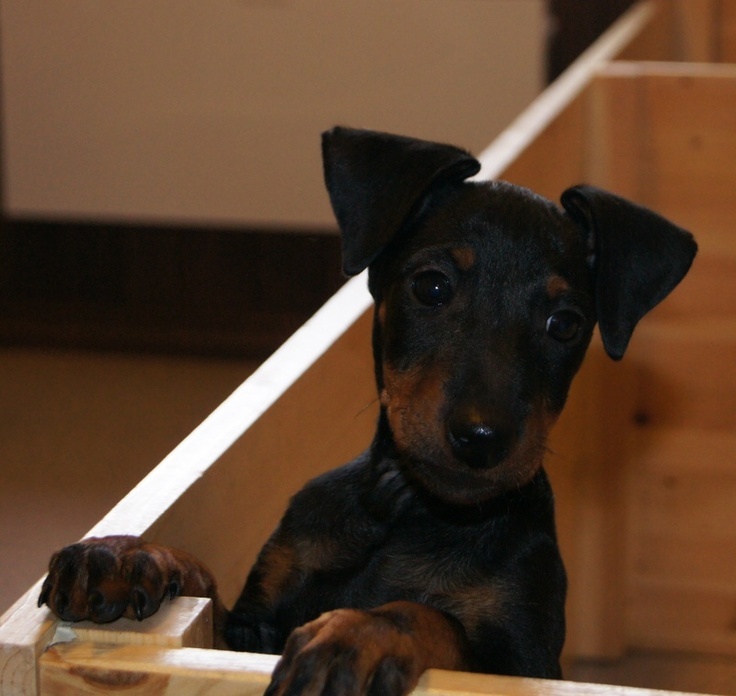 They are now treated as one breed — the Manchester Terrier — with two varieties: Toy and Standard. A breed that enjoys snuggling with its favorite humans, it will enjoy waking up to the alarm in its owner's bed. Known for cuddling, it will wait to get out of bed until its master does. Once up for the day, it'll greet the kids with affection before going for a romp in the yard. After a good breakfast, it will enjoy engaging in a game of fetch. After a nap with the smaller humans, the Manchester Terrier will follow them outside to sniff out the perimeter for any unwelcome visitors. Ending its day exactly as it started, it'll be keen for a nightly snuggle session.